The International Institute for Strategic Studies (IISS) is a British research institute (or think tank) in the area of international affairs. 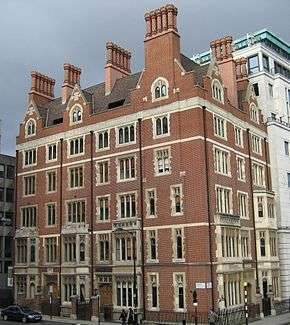 Since 1997 its headquarters have been Arundel House, in London, England. The 2013 Global Go To Think Tank Index ranked IISS as the ninth-best think tank worldwide. Founded in 1958, with its original focus nuclear deterrence and arms control, the IISS has strong establishment links, with former US and British government officials among its members. The institute claims that it "was hugely influential in setting the intellectual structures for managing the Cold War." In 1959 the ISS issued a pamphlet on the "military balance" between the Soviet Union and NATO. It was unfortunately replete with errors, having been put together from published sources of widely varying quality. I called this to the attention of Alastair Buchan, the director of the institute, who was quite disturbed. A new version was issued in November 1960, much more correct and accurate, though still not up to the latest intelligence. Again, I called this to Buchan's attention, and he undertook to check out with British authorities what became annual issuances. The second issue appeared under the title "The Communist Bloc and the Free World: The Military Balance 1960". The current Director-General and Chief Executive is Dr John Chipman CMG. The Chairman of the Council is Francois Heisbourg, a former Director. Sir Michael Howard, the British military historian, is President Emeritus. Sir Michael founded the institute together with the British Labour M.P. Denis Healey (Defence Secretary 1964–1970 and Chancellor of the Exchequer 1974–1979) and journalist Alastair Buchan. primary source of accurate, objective information on international strategic issues for politicians and diplomats, foreign affairs analysts, international business, economists, the military, defence commentators, journalists, academics and the informed public. The Institute owes no allegiance to any government, or to any political or other organisation. The Institute claims 2,500 Individual Members and 450 Corporate and Institutional Members from more than 100 countries. The IISS publishes The Military Balance, an annual assessment of nations' military capabilities; the Armed Conflict Database; Survival, a journal on global politics and strategy; Strategic Survey, the annual review of world affairs; the Adelphi Papers series of monographs; and Strategic Comments, online analysis of topical issues in international affairs. The Institute hosts the Shangri-La Dialogue, an annual meeting of Asia-Pacific region Defense Ministers in Singapore, and the Manama Dialogue, an annual meeting of Persian Gulf-region security ministers and officials in Bahrain. Based in London, the IISS is both a private company limited by guarantee in UK law and a registered charity. It has branches in Washington, D.C. (IISS-US) and in Singapore (IISS-Asia), with charitable status in each jurisdiction, and in Manama, Bahrain (IISS-Middle East). ↑ 2013 "2013 Global Go To Think Tank Index Report" Check |url= value (help) (PDF). 22 January 2014. ↑ A Journey Through the Cold War, 2004, p.64. See also "Conflict: An International Journal", 1987 edition, 85-86. ↑ "Authors of the report – Iraq". The Times. 10 September 2002.